Stirring interest in children to learn is the first step to success in teaching any subject. The best way to introduce drawings to children is by using simple letters, numbers and patterns. It is because kids are made to learn and recognize letters, numbers and geometrical patterns like circle, square, etc. in their early childhood education and by creating pictures out of them we are encouraging kids to expand their creativity. This method of teaching drawings pictures is not new to us as we ourselves have involved in doodling in our childhood as well as there are many instructions online on how to teach kids to draw pictures. Especially targeted at children, this approach of drawing teaches kids how to draw animals, birds and even human emotions in the most efficient way possible. 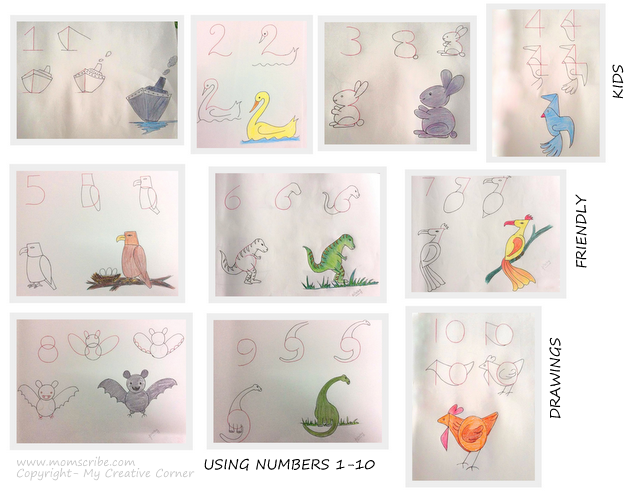 Reinforcing ideas to teach kids how to draw using numbers is a big hit among children especially because of its simplicity. 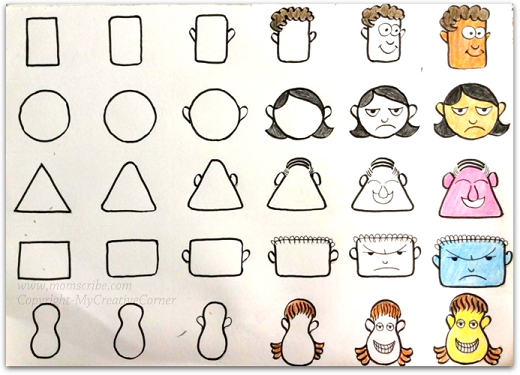 This drawing technique allows the kids to sketch their first step in creating a simple drawing or to come up with something themselves. 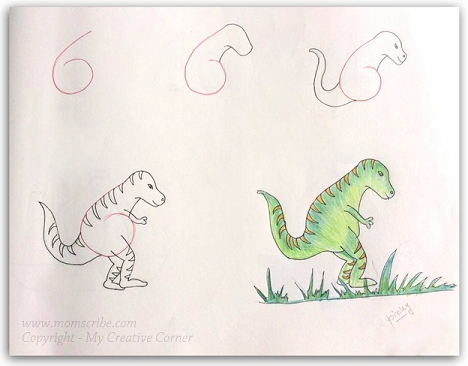 The dinosaur drawing using number 6 was my son's favorite bit of drawing. The above number based drawing from 1 to 10 is created artistically and I am sure you would like to know the face behind these drawings. The creative brain behind the above drawings is Protiti Sen alias Pinky who is a full time homemaker and mother of two beautiful daughters. Having stumbled upon this number based kids drawing on a Facebook page, I decided to know more about the real person behind this creative drawing as well as requesting permission to share some of her drawings. Pinky as she loves calling herself says that she loves teaching her children to draw easily in a different way using numbers, alphabets and shapes. And no doubt, her love and passion of kids friendly drawing gave birth to My Creative Corner Facebook Page which is attracting fans all around the world. According to Pinky, an artist’s eye is the main source of inspiration as each one see their surroundings differently, think differently and try to create drawings with their own creative touch and the end product gives them an immense feeling of satisfaction. Most of her drawings are experimentation and hence you can find few alphabet based drawings and some random drawings for kids including the rest of her creative works. Her future plans is to publish a book for kids friendly drawings and to organise workshops in collaboration with some schools. And in the near future she says that she would like to open an institute for kids where all activities related to art and craft will be taught. With her pen name "Pinky", Protiti Sen, an unseen face among her fans (until now) kindly allowed me to show herself through this post. She is very active in her Facebook page "My Creative Corner" where she inspires her fans teaching kids drawing.